The last time Samsung put on a show in Barcelona, it came bearing the Galaxy S5 and that love-it-or-hate-it bandage back. Not exactly a high point in the company's design history, you might say. Over the past year, though, the Korean juggernaut has come to the realization that it needs to pare down and push a few more envelopes, a philosophy that begat weird, arguably wonderful experiments like the Note Edge. So, Samsung, it's been a year -- how far have you come? We have our answer. Meet the Galaxy S6 and the S6 edge. The reason we're discussing both phones at the same time is simple: If you look closely enough, you'll find they're identical in almost every way that matters. Both sport bodies hewn of aluminum sandwiched between two layers of Gorilla Glass 4. Both sport 5.1-inch Quad HD Super AMOLED screens (more on them later). Both have Samsung's latest octa-core chipset thrumming away in them, chipsets that pair a quad-2.1GHz processor with a quad-1.5Ghz one. (Oh, and they've both got 3GB of RAM, just for good measure). Both support LTE cat. 6. Both are slated for a global launch on April 10th. You get where I'm going with this. Thing is, one is staggeringly prettier than the other. I'd be dead right now. To absolutely no one's surprise, the Galaxy S6 edge is going to get the lion's share of attention here at MWC, and probably over the weeks and months that'll follow. It's absolutely beautiful -- easily the best-looking, best-feeling phone Samsung has ever made. The edge's 5.1-inch screen gently curves away from you, leaving just enough room on the edges for the traditional power button and volume buttons. In case you were wondering: no, none of the wraparound apps created with the Note Edge SDK will work here; you can swipe through notifications and sift through news items, but there isn't much more than that. Samsung's main motivation in curving that screen was to make a phone that feels intensely comfortable in your hand, and you know what? They did it. Strangely, I couldn't help but reminisce about the HTC One M8's polished, smooth contours. With HTC's minor design tweaks in place, the S6 edge almost feels more like the M8 than the M9 does. Now, the S6 doesn't look bad at all: With its more conservative flat screen, it's a handsome metal-and-glass evolution of the Galaxy S5. if the edge wasn't unveiled right alongside it, we'd all be at least a little more forgiving. I only had about an hour to share with the GS6 twins, and trying to test for performance on not-quite-final hardware is pretty dicey to start with. That said, both devices ran terribly smoothly -- every one of my actions and every one of the phone's responses seemed fluid. Effortless, even. Thumbing through webpages, jumping in and out of open apps with the manic frenzy of a rabid squirrel and generally just trying to be a jerk didn't phase the S6 or S6 edge in the slightest. In hand, both models felt just as snappy as HTC's One M9, though we'll have to wait for the benchmarks to help deliver the final verdict. Anyway, we've got a few things to thank for that snappy performance: Samsung says that Exynos octa-core chip running the show offers a 20 percent leap in performance while dramatically cutting down on power consumption, and Samsung's surprisingly light touch with TouchWiz this time around. The TouchWiz of yore was an unsightly and ungainly mess, but with every generation Samsung has dialed down its intensity. This time, Samsung's UI is paired with Android 5.0 Lollipop, and while most of TouchWiz's features worked the same, they were redesigned with the lighter, cleaner Material Design aesthetic in mind. Not every feature made the cut this time, either. Samsung's new outlook on life is totally cool with excising extraneous bits if it helps improve the overall experience. Again, it's way too early to pass judgment, but I'd say the strategy seems to be paying off. For the first time in my life, I'm actually sort of enjoying TouchWiz. Samsung spent a year tinkering with camera modules, too, and the end result is the 16-megapixel rear shooter with optical image stabilization and an f/1.9 lens. My early results seemed promising, though, really, I was shooting in a tiny hotel room -- we'll see what the camera can really do once we get our review unit in. Still, thoughtful touches like double-tapping the home button to very quickly launch the camera and auto-tracking autofocus during video seem poised to help dramatically. Throw in support for both major wireless charging standards and magnetic wave payment technology that'll come to the market as Samsung Pay and you've got two devices that seem like the first substantive step forward this lumbering giant has taken in a long time. Is it a huge step? Maybe not, but it's movement in a positive direction. In the end, the only real differences between the two are the inclinations of the screens they sport, the batteries lurking inside and their price tags. We don't know how much they'll cost, but the edge will carry a notable premium over its pedestrian cousin. And there are, as always, some caveats you need to know. You'll be able to choose from 32, 64 or 128GB variants, but choose carefully: There's no room for a microSD slot anywhere. You can't remove the battery (the one major downgrade from the GS5). You've got a whopping four colors to choose from. One looks hugely better than the other. Other than that, though, Samsung is sending one message loud and clear: "Don't count us out." Lesson learned. 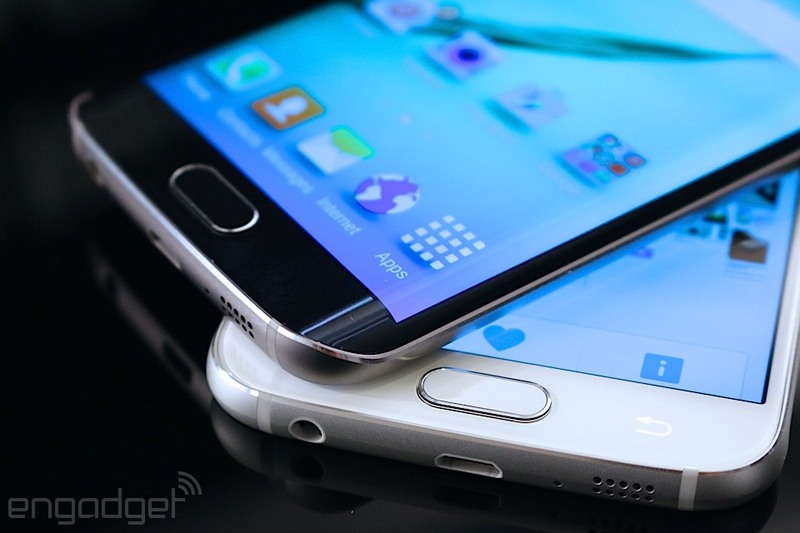 Will you buy Samsung's Galaxy S6 or S6 Edge?